Typically, my monthly updates focus on the remarkable student achievements and activities happening at all levels of Principia. This month, in the interest of presenting a fuller picture of the state of the institution, I’ll also share some recent decisions we’ve made to ensure the long-term sustainability of a Principia whole man education. The College mediation team has just returned with multiple trophies and awards after a stellar performance in an international tournament in Dubai. In some cases, our undergraduates even outperformed third-year law students. This semester brings a terrific lineup of special events and speakers. Later this month, our annual Monitor Night Live will feature Christian Science Monitor editor John Yemma and several national and international Monitor correspondents tackling the topic "Breakthrough 2013: From Washington to the Middle East, Can Political Impasses Be Broken?" You are invited to join us in Wanamaker Hall or on Principia Internet Radio at 7:30 p.m. CT on February 21. During this period of global economic turmoil, Principia has faced the same challenging financial headwinds as many other schools and colleges nationwide. As you likely are aware, we initially responded by deferring substantial capital projects, looking for revenue opportunities, and allowing selected attrition during the last few years. However, this has not proven to be sufficient to reach a sustainable financial balance. Recognizing this need for sustainability, the Principia Board of Trustees has requested that we reduce the annual draw on the endowment to no more than 6 percent by academic year 2019–20. Of course, in order to reach this goal, we must begin our adjustments now. 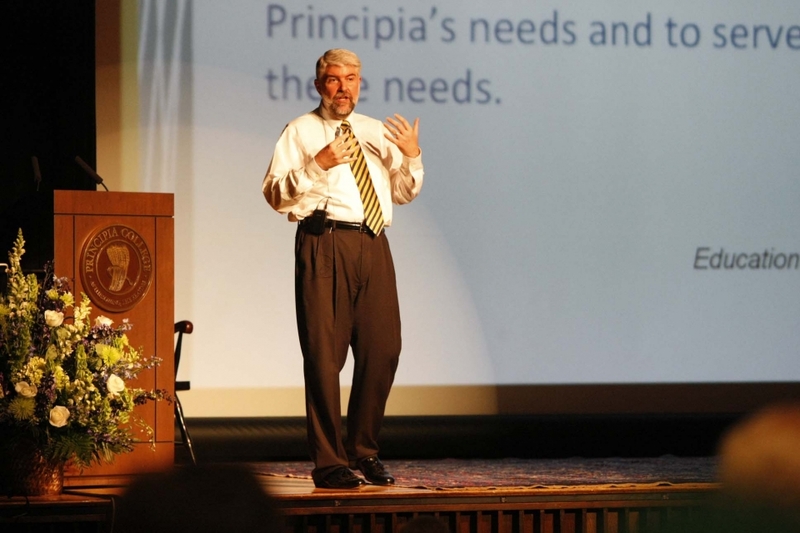 The decisions are based on input from Principia’s Joint Administrative Team, made up of leaders from the School, College, and Shared Services. The shifts address the need to better demonstrate financial sustainability, provide support for our strategic direction, and increase operational efficiency while responding to educational and enrollment changes. The streamlining and adjustments announced impact 42 budgeted positions (approximately half of which are vacant slots or planned retirements). In planning ahead for the upcoming budget year, we wanted to provide employees with as much notice as possible. Our aim is to give those who will be leaving time to secure a new position; in addition, Principia will be providing career transition support to all individuals impacted by these changes. Along with other operating budget reductions and increased operating revenues, the changes result in a net financial improvement of $3.7 million for 2013–14 and following years. In addition, we are postponing or reducing several capital projects. Even with these adjustments, Principia’s 2013–14 expenditures will be $6 million above a 6 percent endowment draw. However, the planned adjustments put us on a trajectory to meet the goal for 2019–20. For more details, you are invited to review a Financial FAQ, including questions that were addressed during the Joint Staff Meeting on January 18. A great deal of prayer and thought has gone into these decisions. The reductions are carefully considered, thoughtful, and balanced across all areas of Principia. They do not reflect across-the-board cuts but rather focus on areas where we think we can and should achieve additional streamlining. Some of these reductions reflect the continued enrollment challenges on both campuses, and I ask for your help in expanding Principia’s reach to more Christian Science students. Overall, the shifts reflect our need to thoughtfully steward Principia’s resources while preserving—and continuing to bolster—the quality of our educational offerings. Throughout its history, Principia has overcome challenges similar to those we face today, and we remain firm in our conviction that, just as in the past, demonstrating the path forward through these trials will strengthen our foundation for future service. As Principia founder Mary Kimball Morgan stated in the school’s early years, “The problem of education is ever before our thought, demanding successful solution. It is a demand we shall continue to have with us as human thought and experience unfold. To be progressive, education must constantly adjust itself to meet these changing conditions” (Education at The Principia, p. 5). Thank you for your consecrated prayers in support of Principia. We are continually working to realign our structure and operations to meet changing educational conditions and scale operations to current student needs. I am confident that these adjustments support those strategic goals.